Last week we introduced you to the new coffee from Rwanda. It has quickly become a favorite among many of our customers (and staff). This morning we roasted some of the new coffee from El Salvador and I'm sipping on some right now. They just keep getting better! This coffee is SO SMOOTH with a velvety mouthfeel. A bit of fruitiness but not overwhelmingly so, and some delicious caramel sweetness with just a touch of chocolate on the after taste. It's been a few years since we had the coffee from El Salvador but I believe this one surpasses it! hand-picked in a perfect red yellow color. it is certified by the Rain Forest Alliance seal. This certification assures the farm is sustainable with the environment and wild life. team assuring the best quality at the pulpers and washed through a continuos flow aqua-pulper. Then it is dried on African beds in the heat of the sun. The drying process takes from 12 to 18 days. to select the best lots to export. With the addition of these two new coffees, we are now able to offer 24 different coffees to offer our customers. A perfect opportunity to come in and let us make a pour-over for you. And the weather couldn't be more perfect for drinking coffee! The new development across the street from the shop is going up at a "lightning-fast" pace. It's sad that we've lost what little view we had of the St. Johns Bridge but it's also exciting to think about the prospective new customers. We joked with a customer the other day that we'll have to install a zip-line between the shop and the apartments to deliver coffee drinks to the residents. Starting this Friday, January 22nd, we have a special promotion going on. With a minimum purchase of $25, get a free ceramic logo mug. Quantities are limited so don't hesitate. Until next week, take care, have a great weekend and keep the coffee flowing. And we're off like a herd of turtles!!! I don't know about everyone else but I'm ready for some warmer, drier weather. I guess I shouldn't complain too much after what the folks in the Midwest have been going through. After the frenzy of the holidays, things seem to have slowed down just a bit although the shop has continued to be busy. A lot of people have been coming back for items they'd had the ir eyes on before Christmas but which, for some reason, didn't make it into their gift bags. The Travel Presses and Espro Presses along with the logo travel mugs and ceramic logo mugs have been top on that list of coveted items. We also did something this week which we've never done before but which I believe will become a new tradition. When I was taking an inventory of the bags of coffee we had on the shelves, discovered there were a few bags which had been there over one week. So we created a 1/2 price bin so people could take advantage of that opportunity and, it's been a huge success. There's absolutely nothing wrong with the coffee whatsoever. It's just that we like to keep the roast dates on the shelf to be within a week. We are currently sold out of these bags but when the opportunity presents itself again, we'll put a notice on Facebook. And, I would encourage you to stop by the shop when convenient to see if there's anything available. Another new development this week was FINALLY finding an organic, fair trade coffee from Rwanda. I tasted some Rwandan coffee several years ago which was stellar and I've never forgotten it. However, the only coffee ever available was not organic so I never purchased any. However, that has changed. We're expecting our first delivery of it today. Not in time for this weekend but certainly in time for next Wednesday's home deliveries. It's described as having notes of orange, vanilla, floral and is very sweet. I can't wait! As our volume has increased, it has become more difficult to find each and every stone. To mitigate that, we purchased a new piece of equipment called a "de-stoner". Pretty tricky eh? Anyway, it has been earning its place in our shop, doing a stellar job of removing those unwanted items. I think that's about it for this week. Several of us are doing double-duty due to being a couple people shy of our normal crew. Which means, I'm getting ready to head out and do deliveries. Until next week, take good care and many thanks for your continued support. A little bit of remodeling. Already? I guess it's just a natural progression but despite the fact we only opened the tasting room a little over a year ago, I felt the need to change things up a little bit. Nothing major but I'm in hopes the addition of some new shelving will do a better job of displaying our products. 'Tis the season for indoor bulbs. Bestow has narcissus bulbs and boy do they smell great! Another seasonal fragrance is all the many varieties of evergreens being put into wreaths and centerpieces. Swing by for a wreath to adorn your front door and remember to order your holiday centerpieces. Orders placed by December 14th will receive a 15% discount. Call Nyki at 503.208.4395. The travel mugs have been a huge hit! The vacuum insulated stainless steel interior keeps drinks hot or cold for hours and remains condensation-free and the threaded snap shut lid prevents unwanted spills. They're slim enough to fit vehicle cup holders as well as those with smaller hands. The ceramic logo mugs have been on order for what seems like an eternity. I still hope to have them back in stock before Christmas but it's going to be close. People are already talking about Holiday parties and such. If your office is hosting a party and would like to provide brewed coffee, just let us know. In addition to the coffee, we'll provide all the accoutrements so everyone will get to enjoy their coffee the way they like it. Just give us a call at 503.445.2249 to reserve yours. And if you would like to send fresh-roasted organic and fair trade coffees to friends and family, now is the time to submit your orders. Orders can be placed either through the web site or just call or e-mail. And of course, if you have any questions or need suggestions, we're here to help. If you want something really festive to include with your coffee gifts, don't forget about the beautiful Mexican pottery from Delores Hidalgo. Always festive and we'll have more next week. And last but not least, I was finally able to figure out a way to add a donation function to the shopping cart for those would like to support The Coffee Trust's effort in dealing with the La Roya blight in Central America. Many thanks for your continued support and keep the coffee flowing. Well, this certainly feels like the perfect Halloween weather. Blustery, with rain and lots of leaves on the ground. We have the perfect beverage solutions to ward off this cool, wet weather. Saturday, we'll be doing a repeat of last year for the local kiddos. From 1-3 tomorrow we'll be serving up complimentary hot chocolates for the trick-or-treaters of St. Johns. St. Johns Main Street has organized a "Trick-or-Treating" extravaganza where various St. Johns businesses will be handing out a variety of treats to young children in a safe and friendly atmosphere. It turned out to be a very popular event last year so I would suggest arriving early. 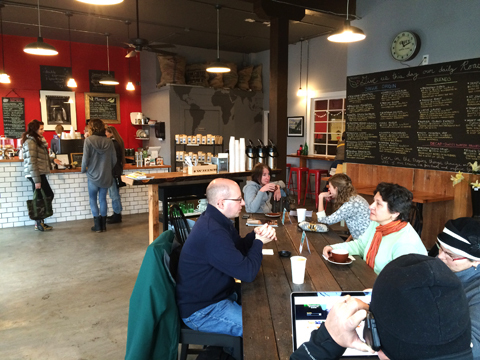 Last week I mentioned the Coffee Fest event which took place here in Portland this year. I was finally able to get down there on Sunday and saw a lot of great things, several of which we'll be offering in the coming weeks. The first item we'll be adding is pre-packaged oatmeal from Straw Propeller Gourmet Foods located in Redmond, Oregon. I've wanted to offer some other food options for a long time and I believe these will be a great addition. I've tasted other pre-packaged oatmeals and like a lot of things, are typically overly sweetened and just leave a bad taste in one's mouth. Not the case with Straw Propeller's oatmeals and mueslis. We should have them in the shop beginning Tuesday or Wednesday of next week so look for them. Another change we'll be making beginning this next week is we're going to be changing our checkout system. I realize this probably seems irrelevant to most people but what I hope to accomplish is streamline the check-out process so wait times are minimized. For those of you who participate in our "frequent flier" program, don't worry, we'll still be able to retrieve previous rewards. A lot of you have requested we offer travel mugs so I'm in the process of selecting some that we'll be able to offer. I'll keep you posted once the details have been worked out. Already in stock are a new s election of t-shirts in both women's and men's styles as well as the very popular hoodies. Many who have been in the shop have marveled at the terrariums available from Bestow. Now you can learn to create your own. On November 12th from 6-8pm, N yki will offer a workshop on creating one's own tropical Terrariums. Call Bestow for more information. 503.208.4395. Painter Jeanne Levasseur, whose paintings have been on display i n the shop for the past couple months came in the other day and swapped out everything with new work so I would encourage everyone to come in and check it out. As with her other work, it's stunning. Just a few more weeks remain for The Coffee Trust, La Roya Recover project so please come in to learn abo ut this devastating blight and help support the coffee farmers of Guatemala so they can gain valuable skills in organic solutions to mitigate this disease. That's about it for this week. Please stay tuned for updated information on new products and coffees. Meanwhile, take care and keep the coffee flowing. And we're off like a herd of turtles! Well, more like a herd of rabbits. 2015 is off to an amazing start. Things continue to evolve here at the shop and already plans are in the works for events in February. Before you know it, we'll be talking about Christmas again. Ok, sorry about that. This week we received word that St. Johns Coffee Roasters will be the featured organic coffee resource for Amy's Kitchen, located in Petaluma, California. For those of you not familiar with them, Amy's Kitchen is a family-owned, privately held company that manufactures organic and non-GMO convenience and frozen foods. February is shaping up to be a big month. The folks from Amy's Kitchen will be visiting us in the first week of February and as I mentioned several weeks ago, we will be hosting an art opening featuring the work of local florist, Francois Weeks and photographer, Ted Mishima. Mark your calendars for Saturday, February 20th from 6 pm - 9 pm. I'm excited to be able to feature their work and believe you will enjoy it as well. 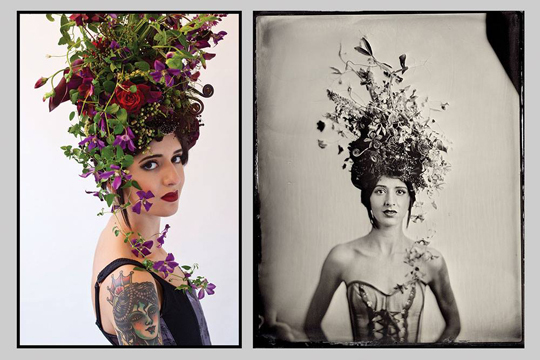 Ted's photographs and Francoise's botanical creations will be on display, including live models. Refreshments will be served. We would also like to welcome Lula's Cart to our list of customers. Lula's Cart is located at 1477 NE Alberta and plans to open in late January. They specialize in gourmet organic dishes and soups. Stay tuned for further information. And finally, today is the last day to vote for your choice in the Spirit of St. Johns grant contest. Marvel 29 (new apartment development) is offering a matching grant for the St. Johns business that voters feel embodies the spirit of St. Johns. Many thanks and keep the coffee flowing!